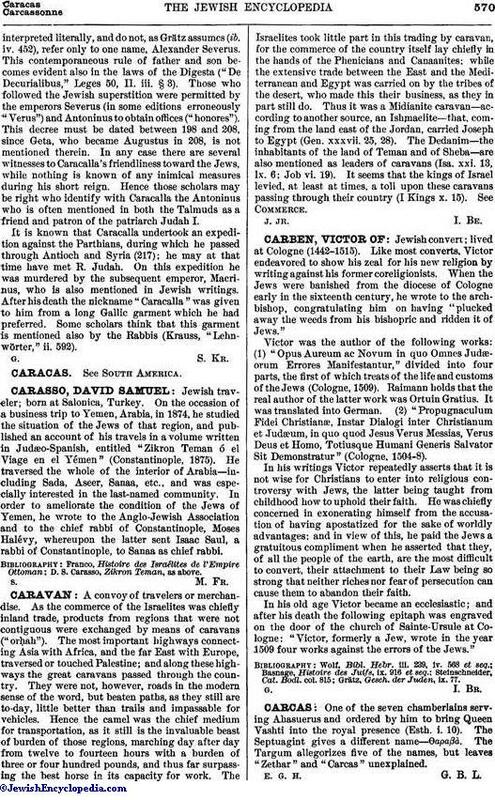 Jewish convert; lived at Cologne (1442-1515). Like most converts, Victor endeavored to show his zeal for his new religion by writing against his former coreligionists. When the Jews were banished from the diocese of Cologne early in the sixteenth century, he wrote to the archbishop, congratulating him on having "plucked away the weeds from his bishopric and ridden it of Jews." Victor was the author of the following works: (1) "Opus Aureum ac Novurn in quo Omnes Judæorum Errores Manifestantur," divided into four parts, the first of which treats of the life and customs of the Jews (Cologne, 1509). Raimann holds that the real author of the latter work was Ortuin Gratius. It was translated into German. (2) "Propugnaculum Fidei Christianæ, Instar Dialogi inter Christianum et Judæum, in quo quod Jesus Verus Messias, Verus Deus et Homo, Totiusque Humani Generis Salvator Sit Demonstratur" (Cologne, 1504-8). In his writings Victor repeatedly asserts that it is not wise for Christians to enter into religious controversy with Jews, the latter being taught from childhood how to uphold their faith. He was chiefly concerned in exonerating himself from the accusation of having apostatized for the sake of worldly advantages; and in view of this, he paid the Jews a gratuitous compliment when he asserted that they, of all the people of the earth, are the most difficult to convert, their attachment to their Law being so strong that neither riches nor fear of persecution can cause them to abandon their faith. In his old age Victor became an ecclesiastic; and after his death the following epitaph was engraved on the door of the church of Sainte-Ursule at Cologne: "Victor, formerly a Jew, wrote in the year 1509 four works against the errors of the Jews." Gr?ätz, Gesch. der Juden, ix. 77.